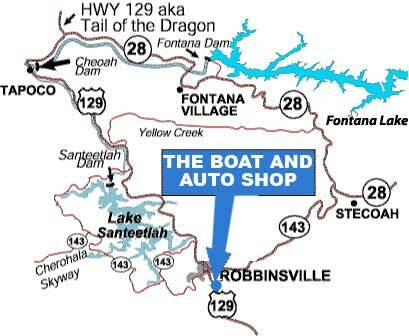 Boat and Auto Shop – Robbinsville North Carolina – Robbinsville NC – Located on US129 Serving Lake Santeetlah, Fontana Lake, Cheoah Lake, and Calderwood Lake. Robbinsville NC - Located on US129 Serving Lake Santeetlah, Fontana Lake, Cheoah Lake, and Calderwood Lake. The Boat and Auto Shop located in Robbinsville North Carolina. Home to Lake Santeetlah, Fontana Lake, Cheoah Lake, and Calderwood Lake. Surrounded by the Nantahala National Forest and bordering the Great Smoky Mountains National Park.